Tillykke med fødselsdagen or Happy Birthday for many years to come. In case you’re wondering this is what the slot name Fodselsdagen actually means in Danish. We’ve seen a big number of video slot games with a birthday theme so far, but this is the first one that is focused on Danish players. The game intro starts with a birthday party with symbols of birthday presents in various shapes and sizes and card symbols in the form of birthday candles. No birthday can go without a birthday cake which is the wild symbol in Fodselsdagen and a birthday party where the music instruments are the scatter symbol. The designers of the game added a cartoon note to the symbols and animations, while the background music is a mix of birthday songs and cheers of joy by the guests invited. So whenever you are feeling down come spin the reels of Fodselsdagen and you can relive your best birthday party ever once again. Fodselsdagen is Play N’ Go’s way of wishing their players a happy birthday each time they feel in the mood for a birthday party. This game deviates a bit from the standard Play N’ Go design, but is a real refreshment from the standard games offer on the market. The designers decided to go with a strong combination of white and red, complemented with some top of the line animations. In addition to the great visual details Play N’ Go made sure to keep the party going with interesting and attractive bonus features as well. Fodselsdagen has 20 active pay lines, 5 reels and 3 rows in total. The pay line number can be altered from 1 to 20 depending on how you want to play the game, allowing you to place bets from $0.20 to $100 per spin. The total bet size is adjusted by using the Coins button, up to 5 and the Coin size button form 0.01 to 1. If you wanna sit back and enjoy the birthday party on the reels of Fodselsdagen just go to the Auto Play button and set it anywhere from 0 to 50 auto spins. The best part of any birthday party is when the presents are opened and the birthday cake is brought in with candles on top. The designers at Play N’ Go decided to use these moments to design the bonus features of Fodselsdagen. The surprises continue as instead of the classic one, Fodselsdagen has two great bonus features. The time to open the presents start when 3 or more bonus symbols in the form of balloons fall on the reels. Here the presents are all piled up and you will have 3-5 choices depending on the number of triggering bonus symbols. As you chose each present you zoom in on it through a crosshair and each one of them will award a cash prize of up to 25 x bet. So if you’re lucky you can have a maximum win of 125 x total bet. 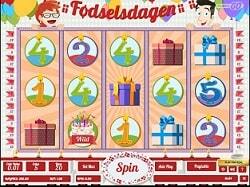 The second bonus round in Fodselsdagen is a free spins bonus, triggered by 3 or more scatters on the reels. At least 3 scatters will award 15 free spins, 4 scatters 20 free spins, while 5 scatters will award 25 free spins and a great 300 x total bet starting payout. A small downside of the free spins bonus round is that there is no multiplier attached, but to compensate for this the scatter symbol will also act as an extra wild. Because of this extra scatter function the free spins bonus round can’t be re-triggered. Fodselsdagen is a low variance video slot game which doesn’t have the potential for some massive payouts. As we said the scatters have a maximum payout of 300 x total bet, while the wild has a bit smaller maximum payout of 250 x total bet. With this in mind the free spins bonus should have a maximum potential of no more than 500 x total bet. Play N’ Go decided to take it easy and have fun with their latest release Fodselsdagen, congratulating all players their birthdays, but focusing more on players coming from Denmark. They managed to create a funny and attractive video slot game, which may not have the potential to pay big, but is sure to keep you entertained. Either way you can now try it for real across the Play N’ Go network and see what kind of presents you can scoop up in the bonus rounds of Fodselsdagen.